Make a slice of pie extra special topped with caramel sauce and toasted nuts. There are so many good things to sample during this season of good eating. And some of those are well-loved dishes that hold special memories when they appear. I come from a family of really really good cooks—it’s in my genes. I enjoy cooking. Sharing food info and our family’s food heritage are the reasons I created ChowChow & Soul™. Lately I’ve enjoyed Mommy and Me cooking afternoons to make sure I have all the details on those heritage recipes we love. On a recent afternoon we baked Apple Pie. This is one dessert that Daddy absolutely loved. Friends know this deep-dish fruit pie is one of Mommy’s specialties; food writer Sharon Sanders sampled it and wrote about Mom and her pie expertise in the Chicago Sun-Times. It was the perfect choice for us to bake together since I’m aiming to fine tune my pie baking, something I shared recently with Same Chic Different Day. This confection is a tradition—it wouldn’t be the holiday without this pie on the table. Sift flour and salt in a mixing bowl; cut in shortening with a pastry blender. In a small bowl, combine milk, egg yolk and lemon juice. Add to flour mixture, gently stirring until all flour is moistened. Shape into a ball. Refrigerate for 30 minutes. In a mixing bowl, combine 1/2 cup each granulated and brown sugars, flour, spices, salt, lemon juice and apples. Toss lightly to mix. Set aside. Divide pastry in half. On lightly floured work surface, roll pastry from center into a circle 11/2 inches larger than a regular 10-inch pie pan or a 9-inch deep-dish pan. Place circle in bottom of pan. Press to fit. Pour reserved apple mixture into crust. Dot apples with butter. Roll remaining pastry from center into a circle large enough to cover filling. Place crust over apple filling. Fold top edge under bottom edge, trimming if necessary. Flute edge. Cut slits in top pastry. Brush top crust with lightly beaten egg white (reserved from pastry). Sprinkle lightly with granulated sugar. Bake in preheated 400-degree oven 20 minutes. Reduce heat to 375-degrees. Bake 40 to 45 minutes until crust is browned and juices bubble from slits. Remove from oven to cool. 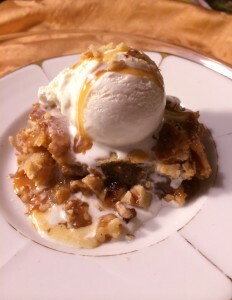 Serve with vanilla ice cream, caramel topping and toasted walnuts, if desired. Makes one 10-inch pie. Thank you Walt, glad you like it. Think I have just enough for one more slice today!